A remarkable amount of Berlin’s rapid transit system is elevated, in a range of viaduct styles. These lines are a delight to ride because of the continuous views they offer. But of course the real test of a viaduct is what it’s like to be under or next to it. Often this isn’t a big issue because these segments run along the medians of very wide boulevards, just like the U6 viaduct in Vienna, so nobody has to live right next to or under them. But the Stadtbahn is something else. Completed in 1882, it runs east-west right through the middle of the city, with all kinds of urban land uses right next to it. It’s a major visual presence in many of Berlin’s iconic sites, from affluent Charlottenberg to the Frederichstrasse shopping core to the “downtown of East Berlin,” Alexanderplatz. It even skirts Berlin’s great central park, the Tiergarten, and looks down into the zoo. If you were proposing to build it today, virtually every urbanist I’ve ever met would instinctively hate the idea; if the idea somehow got past them, the NIMBYs would devour it. The most visually sensitive segment traversed by the Stadtbahn is between the main rail station and Alexanderplatz. Here the viaduct skirts the core government zone — an area of intense national symbolism and architectural sensitivity — and then runs very close to Berlin’s main river, the Spree, through a cluster of cultural institutions. It even comes right out on the river at one point, briefly walling it off. In short, it goes all the places that we would least want a viaduct to go. Yet much of it is beautiful. Most of the viaduct is built as a series of brick arches. Each arch is large enough to contain rooms. Today many of these are retail space, most commonly restaurants. These restaurants put their tables outside, sometimes facing a park but still, unavoidably, right next to the viaduct, and they’re very pleasant places to be. A train clatters overhead every minute or two, but it’s not dramatically louder than the other sounds of urban life, so it’s a comfortable part of the urban experience, devoid of menace. I could sit in such a place for hours. In some cases, the commercial street next to the station is activated, in part, by all of the businesses occupying the arched rooms under the viaduct. At Savignyplatz, one of Berlin’s best architectural bookstores is in such a space. Stations on the line are substantial. They are integrated into surrounding buildings and with plenty of ground-level retail, but they are unavoidably dominant presences in each district. Of course, one key feature of the Stadtbahn, compared to most recent freeway or transit viaducts, is that its underside is closed off except where it crosses a street. There is no continuous under-structure space that would be a depressing presence in the neighborhood below. Instead, the Stadtbahn is a continuous wall, pierced by streets but otherwise mostly enclosed to create spaces that can be useful in various ways. Obviously, when crossing a sensitive area such as a marshland, the arches can be open; it depends on what works in each segment. Europe has some really beautiful transit viaducts, including some in the dense centres of cities. Most of them are a century old, so the city has partly grown around them. 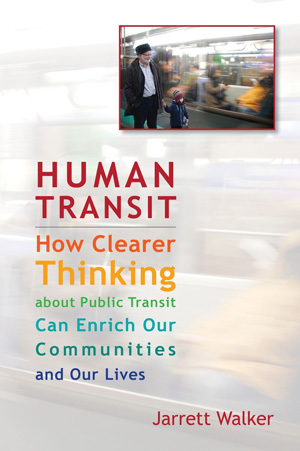 But the effect is sometimes so successful that I wonder if we shouldn’t be looking more closely at them, asking why they work, and whether they still have something to teach us about how to build great transit infrastructure. I’m not proposing a specific one, just wondering if we should open this door a bit. Excellent post, Jarrett. When I’ve visited Berlin, I’ve also been struck by how well integrated the stadtbahn is into the surrounding city. I think we could learn a lot from the way it’s built. But the problem is that the lessons from Berlin can really only be applied in the dense center city, where you can put shops and activities underneath. It’s hard to imagine Menlo Park doing a similar type of thing under the future CAHSR… which explains much of their opposition to an elevated high-speed line. On the other hand, Honolulu, which is building its own new elevated rail line, certainly could attempt to adapt some of these ideas for the downtown sections. This is key. Whatever you do, don’t build your viaduct out of plain old un-soundproofed steel beams. long pauses every couple of minutes. My neighbor, David Rosasco, said he looked into the possibility of soundproofing the el, but the weight of the soundproofing would require reinforcing the supports, which drove the costs through the roof. In the IRT’s defense, at the time it built the 7, Woodside was not even suburban; the el was flanked by farmland. I think the key is that the Berlin Stadtbahn cuts its own right of way through the city, rather sitting on top of a street and blocking out the sky. Unfortunately, in the US such a scheme would most likely require lots of eminent domain takings unless you could somehow assemble enough alleys into a right of way, sort of like Chicago has in some places on the L. And I suspect that the Seattle Monorail would have been the street-covering kind, while Caltrain of course already has its own ROW. The key is that when the Stadtbahn was built, it wasn’t that hard to cut a new ROW. New York has ROWs like that, too, all dating back to the late 19th or early 20th century. And yet, when the built the 7 through farmland, they built it down streets for the entire length. Go figure. But rather than looking to new overhead lines, my mind went to retrofits, and to damage mitigation where we already have overhead rails and roads. In New Orleans a dreary loop of I-10 swings near Downtown and the Quarter. And I-35 cuts through Austin, bringing the lively Sixth Street pedestrian scene to a dead halt. San Antonio is plagued with overhead expressways on almost every side of its center city. Houston may be worse. New York has a stretch on Park Avenue where MetroNorth passes through East Harlem. The street level once housed a lively La Marqueta. But the market and the neighborhood declined terribly in the crack epidemic of the 80s. Time for a fresh look as the area repopulates? I’m afraid that the noise pollution from road traffic might be harder to deal with than that from trains. But could desolate areas underneath the overhead highways be revived and reused instead of serving as parking lots at best, empty spaces at worst. With proper soundproofing, could school buildings be inserted into these publicly-owned plots? If 8 hours of occupancy seems too much, due to vibrations and air and noise pollution, could they put to part-time use as gyms and other indoor rec space, cafeterias, band halls, auditoriums, etc, for schools across the street? Or for public gyms and recreation centers to replace or augment the obsolete facilities usually located inside neighborhood parks? Or would it be animal cruelty to use such blocks for downtown zoo/aviary/aquarium/nocturnal life/rain forest exhibits, perhaps as a branch of the main facility, like the Bronx Zoo’s satellites in Prospect Park, Coney Island, and Central Park? I wouldn’t look first to filling these spaces with retail and restaurants. Nice but, the US has 23 sq ft of retail per capita, while Sweden has 3 sq ft. We may already be overbuilt with retail for the next decade or so. But surely some redevelopment of these vast wasted urban spaces would be worth a serious try. I’m sorry to say you could build a through-block line deep into numerous US downtowns on mostly vacant land. Detroit no doubt, and Camden and Newark, and a dozen other pitiful cases if you think about it. Do you have a reference for the statement about per capita retail space? I’d never imagined there could be such a big difference among countries. But I’m not sure that was the article I saw. The updated 23 sq ft stuck in my mind, but it’s not there. Anyway, these figures and the source, “Retrofitting Suburbia,” by Ellen Dunham-Jones and June Williamson, should get you going. No argument re plebians, but the main issue is avoiding intersections with ground-level streets. US Interstate Freeways were elevated or rarely underground in cities because by definition they couldn’t intersect other streets. The same considerations require either elevation or undergrounding of rapid rail lines, except where there are long segments of intersection-free right of way on the surface (usually alongside a freeway or existing rail line). I think you’ve made a very important distinction. London is full of dramatic brick-arch viaducts, generally not running over roads, but next to them or perpendicular to them, often with shops built under the arches, and they’re all lovely. The modern El used in Seattle for the southern part of Link isn’t bad as concrete-and-steel designs go. 2 – Don’t run an entire road underneath, and permanently in the shadow of, the El. It’s like being in a tunnel filled with gasoline fumes. Seattle’s Link manages to avoid this by going in freeway and wide boulevard medians, across empty lots, et cetera. Philly’s Market Street Line is also in the median of a “sufficiently wide street”. It’s OK to have streets cross perpendicular to an El, and it’s OK to have “enclosed uses” under the El (like businesses), but it’s not really appropriate for a travel corridor. The US has a lot of *really* wide roads, especially in the West, which have lots of cross-streets. Rail lines elevated over the medians of those roads really wouldn’t be a blight at all if they were designed to be architecturally attractive and something interesting was done with the ground-level part of the median (I suggest a second pair of sidewalks, and storefronts…. parking and driving are probably the worst choices).